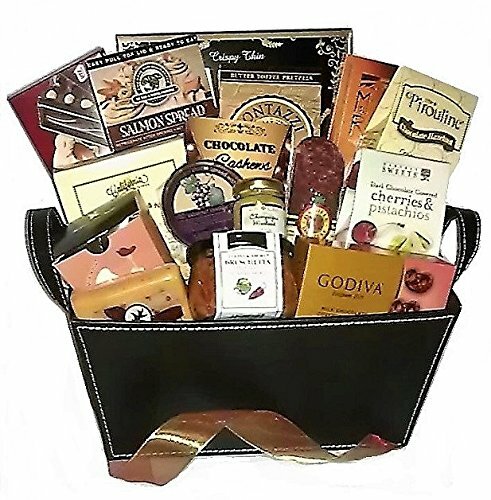 Elegant Gift Basket with gourmet snacks, spreads, gourmet cheese and sweet treats. Includes: Smoked Salmon Spread, Bruchetta in glass jar, Tuscan Salami, Merlot Cheddar Cheese, Brie Cheese Spread, Chocolate Cherry Pistachio, Dried Fruit & Nut Medley, Sesame Crackers, Cheese Straws, Godiva Chocolate Pretzels, Chocolate Covered Nuts, Dark Chocolate Almond Creme Bar, Butter Toffee Pretzels, Mustard and more. Presented in a faux leather basket, wrapped with clear cellophane and tied with ribbon. An all occasion gift basket available every day of the year.